I’m going to create a new reality show – The Parents. Instead of lovesick single bachelors or bachelorettes getting out of a limo and introducing themselves to the prospective spouse, parents will step out of the limo to meet me, the teacher. Over the course of a semester, I will get to know parents and their idiosyncrasies, and they will get to know me seeing up close my commitment to student success. The parents who are chosen to stay will be presented a sharpened #2 pencil while all others will be sent home with a failing report card. The winning parent will be cloned (currently reading a sci-fi novel) and take the place of all other parents. All kidding aside (only because this isn’t possible), parents are some of my biggest encouragers and advocates. Of course, there are some outliers but rather than focus on the bad, my focus will be how to be a pencil-winning parent who is loved by teachers. Teaching your children how to advocate for themselves. Most children need to be trained in the area of speaking to adults even though I have encountered a few who need to be trained in how to tone it down a notch with adults. I am amazed at the number of times I enter grades on Infinite Campus and have a parent email within five minutes. Encouraging your student to ask his or her teacher about a grade or issue in class will not only serve him or her well in the class but in life. Of course, there will be times where parents need to step in but give the child a chance first. Getting the facts before making assumptions. Here’s the deal: I will take everything I hear about your family with a grain of salt if you do the same with everything you hear about my classroom. 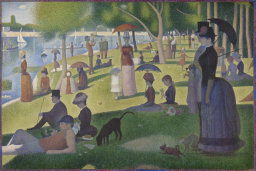 I recently visited the Art Insitute of Chicago and saw A Sunday on La Grande Jatte. Sauret created this masterpiece using a technique called Pointillism, a method of different dots when viewed together make a painting. If you stand up close like Cameron does in Ferris Bueller’s Day Off, you see dots of red, blue, green, black, white, etc. but when you step back, you view the upper class enjoying an afternoon by the river. The same is true with teaching. Individual texts, lessons, activities, and even things said may not make sense on their own leaving parents to wonder what is going on in the class, but when one steps back and views the class a whole, choices make sense. If you’re puzzled about the how or why of a classroom choice, ask the teacher then trust us to do our jobs. I make mistakes. Every single day. I enter grades incorrectly. I add points wrong. I get frustrated. I raise my voice on occasion. I forget to give reminders. And sometimes I just flat out make the wrong call. I don’t mean to do these things; they’re just mistakes. If given the opportunity, I will make right the wrong; just be nice when making me aware of my shortcoming(s). Treating us as a partner in your child’s life. I am not spending 7.5 hours each week with your child because of the financial gain I receive (this is not sarcasm – I am honestly content with what I make). I don’t grade papers on the weekend because I love reading essays so much I can’t put them down (that is sarcasm). I love investing in the next generation and consider it a calling on my life and not something I take lightly. When a parent attacks, accuses or insults me, it’s a slap in the face because like you I am wanting the best for your student. Teachers are not the enemy; partner with us! Not making things easy for your kids. I cannot emphasize this point enough. Parents want the best for their kids and seeing their child struggle is difficult. The first inclination is to jump in and fix it or make it easier for our kids, but in doing so we (I say we here because I’m a parent as well) actually make life harder for them. Students are growing up not knowing how to fail and deal with difficult situations because they have been rescued from them time and time again. Struggle produces perseverance which produces character which produces adults who can function in society. Allow your student to fail and or struggle and focus on the lessons to be learned in the process. Not punishing every teacher for a few bad apples in the profession. Some teachers are unprofessional. Some teachers are mean. Some teachers don’t like kids. Some teachers are waiting out their time until retirement. Some teachers are unfair. Some teachers don’t care. Unfortunately, you’ve probably dealt with a teacher or two like this along the way. Fortunately, these teachers are few and far between. Most teachers are professional, kind-hearted, love students, enjoy the classroom, treat students fairly, and care; please don’t judge us through the lens of one or two bad experiences. We will do the same for you and your student. On discouraging days, most teacher friends I know go to the file or the folder where we keep all of the cards and notes of encouragement. While some school days are long, a positive comment lasts far longer. I have been blessed throughout the years with encouraging parents. Parents have written me notes, sent me texts, sent coffee, coffee mugs, chocolate, written letters to my principal about me, etc. When I am discouraged, I drink coffee, eat chocolate, and pull out my notes and feel better. Interestingly, parents who encourage usually raise kids who encourage. What is said is less important that the fact that the time was taken to say something. Thanks to all of you encouragers! You make a difference in our lives! 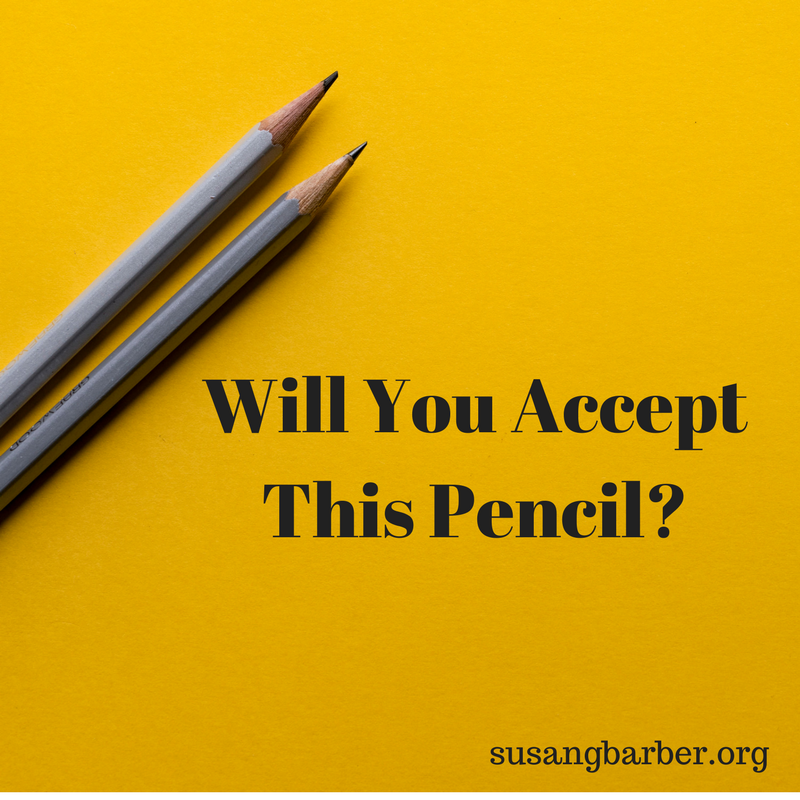 Will you accept this sharpened #2 pencil? ← What is the End It Movement? Love this!! I think this can apply to so many other relationships, as well. Thanks for sharing, Susan!